Stanford University received a A+. Younger than the Ivies and sunnier, too, Stanford has become the nation's most selective institution by providing a world-class education to those dreaming of Silicon Valley riches, as well as those with Olympic medals on their minds. In fact, given that the academics, athletics, architecture and weather are all world-class, it would be fair for some to feel that they had in fact died and gone to heaven, rather than just to a campus known as The Farm. Trimesters rather than semesters make for a fast pace, one that first-year students are well-advised to manage by being careful with their initial course selections. What is a typical Stanford University student like? Describe the type of person that should attend Stanford University. The typical student is friendly and laid-back but also very interested in their field of study. They tend to be intelligent and conscientious as well. The type of student who should attend Stanford should probably mirror those attributes. 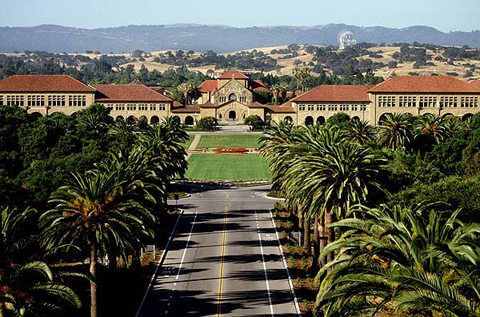 What are the top 3 reasons someone should attend Stanford University? What was a typical Stanford University student like in high school? Describe the type of person that should attend Stanford University. Stanford is a world away from the Gothic intellectual culture of the Ivies. Stanford is famous for its seemingly laid-back students and relaxed pace of life. "The admissions staff here may be the nation's best at saying "no" without breaking hearts." Stanford is perennially ranked as one of the best universities in the nation. In 1876, former California Governor Leland Stanford purchased 650 acres of Rancho San Francisquito for a country home and began the development of his famous Palo Alto Stock Farm. He later bought adjoining properties totaling more than 8,000 acres. The little town that was beginning to emerge near the land took the name Palo Alto (tall tree) after a giant California redwood on the bank of San Francisquito Creek. The tree itself is still there and would later become the university's symbol and centerpiece of its official seal. The Stanfords considered several possibilities - a university, a technical school, a museum. While on the East Coast, they visited Harvard, MIT, Cornell and Johns Hopkins to seek advice on starting a new university in California. (See note regarding accounts of the Stanfords visit with Harvard President Charles W. Eliot.) Ultimately, they decided to establish two institutions in Leland Junior's name - the University and a museum. From the outset they made some untraditional choices: the university would be coeducational, in a time when most were all-male; non-denominational, when most were associated with a religious organization; and avowedly practical, producing "cultured and useful citizens." On October 1, 1891, Stanford University opened its doors after six years of planning and building. The prediction of a New York newspaper that Stanford professors would "lecture in marble halls to empty benches" was quickly disproved. The first student body consisted of 555 men and women, and the original faculty of 15 was expanded to 49 for the second year. The university's first president was David Starr Jordan, a graduate of Cornell, who left his post as president of Indiana University to join the adventure out West. The Stanfords engaged Frederick Law Olmsted, the famed landscape architect who created New York's Central Park, to design the physical plan for the university. The collaboration was contentious, but finally resulted in an organization of quadrangles on an east-west axis. Today, as Stanford continues to expand, the university's architects attempt to respect those original university plans. What are the top 3 things that students do for fun at Stanford University? 94% of students graduated in the top tenth of their class. The average student pays $19,109 for tuition, fees, and other expenses, after grants and scholarships. Total stated tuition is $42,690, in-state and on-campus, before financial aid. Learn more about financial aid at http://www.stanford.edu/dept/finaid/. Estimate the net price for you at http://www.stanford.edu/dept/finaid/undergrad/how/calculator/. 95% of students graduated in six years. The typical (median) early career salary of Stanford University graduates is $61,300, according to Payscale. Stanford University participates in the NCAA Division I-A for college athletics. Want more info about Stanford University? Get free advice from education experts and Noodle community members. What is "social study" for? Is that an activity like working as a volunteer? After entering the web portal address of www.mcdvoice.com, you have to click on the search option. With that, the web browser will take you to the homepage of the McD. I am an international student and I have studied in America for four years as a high school student. Do I need to take the TOEFL exam? What are the most popular extracurricular activities at Stanford? What do you like about Stanford's campus and culture? If my GPA is 4 and your only accept 4 can i get in with a 2? Does Stanford University require IGSCE certificates from international students? If yes, what are the required subjects? What are the conditions to get a scholarship? Getting in Stanford is always a tough task which needs a lot of struggle. From the www.marvelous-reviews.com many smooth things are there to learn for getting prepare to appear in GRE. Do you have Whatsapp, Skype or etc. for communication? What are the Stanford school colors (if they have any)? Do students have to wear uniforms? What was your experience at Stanford? Is it true that Cal students are more fit than Stanford students because the campus is hillier? How should I prepare for my freshman year at Stanford?